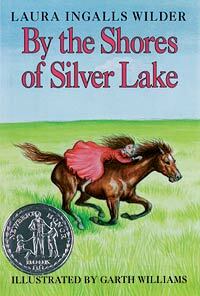 By the Shores of Silver Lake is based on Laura's late childhood spent near De Smet, South Dakota, beginning in 1879. The book also introduces Laura's youngest sister Grace Pearl. Sadly, in the beginning their beloved dog Jack dies of old age. Laura meets her cousin Lena Waldvogel who becomes her good friend (Lena was the daughter of Laura’s Aunt Docia, who married August Waldvogel). Because her sister Mary is blind due to an illness, Laura also acts as Mary’s eyes and becomes kinder and more mature through this service. When they first move to the railroad camp, the Ingalls stay in a railroad shanty, and the following spring they are able to stake a claim of their own. Also her father gets offered a job in the west by his sister. The family travels to Dakota Territory by train—this is the children's first train trip and they are excited by the novelty of this new-fangled mode of transportation. In an hour they cover the distance it would take a horse and wagon a day to cover. Upon arrival, they go to the hotel to eat and await Pa.
Pa shows up within the hour, and they leave for the railroad camp. There, Laura meets her cousin Lena, and she and Laura bunk together for the time that the Ingalls family spends with them. Laura and Lena play together when they are done with their chores, which range from collecting laundry cleaned by a neighbor to milking cows; Laura rides Lena's pony, the first time she has ever ridden a horse. So the family moves, and Laura feels that no one could be as excited as she to be moving into a beautiful house. Winter comes, and one night when Pa is playing the fiddle, Mr. and Mrs. Boast arrive in the middle of a snowstorm; they are migrating West but were caught by the bad weather. They stay past Christmas, and at New Years the Ingalls travel to the Boast’s for dinner. To pass time, Mrs Boast shares her collection of newspapers with Laura and shows the Ingalls family how to make a what-not. Soon afterward Pa goes to file his claim, but two men want the same piece. Mr. Edwards (an old friend of the Ingalls) holds them back while Mr. Ingalls files his claim. While Pa is gone, people emigrating west stop at the surveyors' house on their way to their eventual claims. Ma charges money for the service, and in the end has a little over $42. This money is later used to help send Mary to the college for the blind in Iowa. Pa uses leftover lumber from the railroad to build a house in the new town, because the surveyors are returning and will need the house in which the Ingalls have been living. Though Pa has been awarded his own claim, he needs time to build a house on it, so the family stays in the house in town until the claim shanty is finished, and during the harsh winters when it is too cold to remain in an un-insulated shanty. Laura Ingalls Wilder lived the events described in her Little House books. As a young girl, she traveled with her parents and her older sister, Mary, in a covered wagon across Minnesota, Iowa, and Kansas, and into Indian Territory, where they lived in the Little House on the Prairie. Then the family traveled back to western Minnesota and lived on the banks of Plum Creek. Finally, they went west again and settled on the shores of Silver Lake in Dakota Territory. To encourage settlement of the mid-west part of the United States, Congress passed the Homestead Act in 1862. This act divided unsettled land into sections, and heads of households could file a claim for very little money. A section was 1-square-mile (2.6 km2), and a claim was ¼ of a section. 36 sections made a township. A section was identified by three numbers, for example NW quarter of Section 18, Township 109, Range 38. By paying $10.00 plus other filing fees, a man could get 160 acres (0.65 km2) of land for his use if he could live on it for 5 years and not give up to go back east. The Ingalls’ staked one claim near Plum Creek. In the spring of 1880, Charles Ingalls filed a homestead claim south of De Smet for the NE quarter of Section 3, Township 110, Range 56.